What Is DA Form 2166-9-2? DA Form 2166-9-2, NCO Evaluation Report, SSG-1SG/MSG is a United States Army form used during yearly evaluations of Non-commissioned officers (NCOs) ranked from Staff Sergeant (SSG-1SG) to Master Sergeant (MSG). This form is a part of a series of six forms introduced by the Department of the Army (DA) for purposes of evaluating the performance of senior officers. The DA 2166-9-2 - just like the other NCOER forms - is an organizational report and requires several authorized intermediate and senior raters to provide their assessment of the NCO's annual efforts. The latest version of the form - sometimes mistakenly referred to as the DD Form 2166-9-2 - was issued in November 2015. 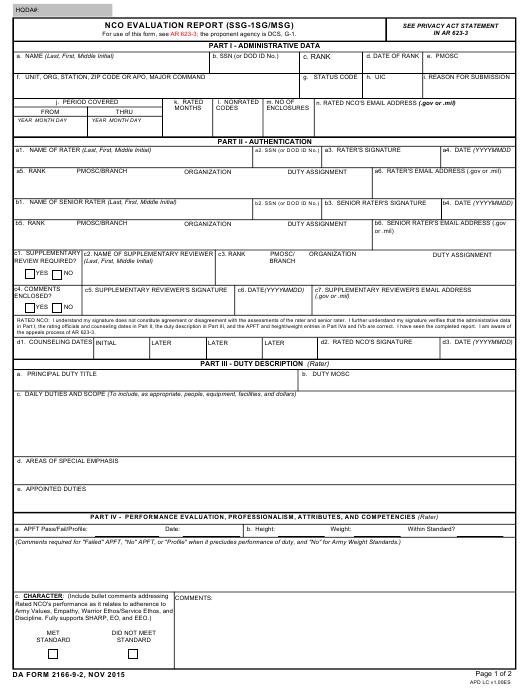 An up-to-date fillable DA Form 2166-9-2 is available for download below or can be found on the Army Publications Directorate (APD) website. An assessment of the officer's overall potential. The first part of the form requires the NCO's personal information. The rater is asked to provide the NCO's name, their personal email address, social security number, information about their unit, rank, the reason for submitting the report, the covered periods, the rated months, the nonrated codes and the number of enclosures. The second part of the form provides information about the staff that will be giving their assessment on the NCO's performance and professionalism. This part consists of both raters' personal information along with their rank, branch of service and organization. Another part of the second section is dedicated to a supplementary rater if there is a need to introduce a supplementary rater into the rating chain. The third and fourth sections of the form are to be completed by the rater in charge of performing the evaluation based on the provided criteria. The sections require a description of the NCO's duties and a brief assessment of their character, presence, intellectual abilities, leadership skills, the potential for development and an attitude for achieving results. After all of the sections are completed and signed, a senior rater is advised to provide additional comments about the NCO's performance in Section 5.